The Golden Toothed Aloe, Aloe nobilis is a great plant for a terrarium. The ‘Golden Toothed Aloe’, Aloe nobilis, has become extremely popular with landscapers, xeriscapers, and for indoor houseplants. ‘Golden Toothed Aloe’, ‘Gold Tooth Aloe’, ‘Green and Gold Crown’, ‘Saw Tooth Aloe’. The Golden Toothed Aloe is a perennial evergreen succulent that grows develops into a carpet of small decorative rosettes. Outside these have bright emerald green fleshy leaves. When growing in full sun the leaves may turn a beautiful orange. The tips of the leaves show a tint rose color. The leaves have goldish colored teeth along the edges. Depending on growing conditions sometimes the teeth are a creamy-white or yellow. The leaves have a narrow lanceolate, somewhat oval shape tapering at the apex to a point. One of the most notable features of the ‘Golden Toothed Aloe’ is how profusely it produces offsets that can form a large colony. This attribute makes it a great landscaping groundcover. Experts disagree on the origin of Aloe nobilis. 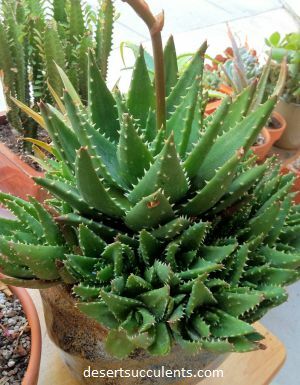 Most agree it is a man-made hybrid but some propose it is a cross between Aloe distans and Aloe brevifolia while others suggest a cross between Aloe mitriformis and Aloe brevifolia. Aloe nobilis is often confused with Aloe perfoliata and sometimes they are even refered to as synonyms. However, the A. nobilis is much smaller, has smaller diameter rosettes and is a lighter green color. Mature Size: Height 6” – 1’ (15cm – 30cm); Spread 1’ or more. Uses: This is a great container plant particularly since it needs limited root space. This plant is ideal for making a succulent terrarium or a dish garden. It is used outside in every type of landscaping. The ‘Gold Tooth Aloe’ needs very little water and spreads relatively quickly as a groundcover. This is my gold tooth aloe. Hello, she is looking quite nice. This isn't like your regular type of aloe that you can put on your skin like aloe vera. This one is actually quite spiky. Look at all these little teeth along the edges of the leaves and all around the insides as you can see here. Imagine poking it. Now I don't know how old this plant is but technically she's a grandmother because smaller pups from this one at my office and that one in the office is starting to have little babies of its own. I’m going to bring my hand in here and try not to poke myself but just so you can see how big this particular plant is. I got this plant from a friend. I'd actually saw it at her apartment when she first moved in and was very impressed by it and several years later I was overjoyed that she wanted to give it to me. So this is the original terracotta pot that it came in. You can see it's got some nice or ugly depending on what you like, I kind of like the look of this. Just the reliance things calcium stains all over it. If we look at this plant from the side, you can see it's kind of slanted towards right here obviously towards light. This plant actually can take can take a bit of Sun actually think it can take a lot of Sun. The one in my office has a good four hours morning Sun. Earlier in the summer I tried to correct this slant by repotting it trying to pack more soil into the one side trying to sort of lift it like this and pack more soil into this front side. But I guess every day it just kept growing towards light as plants always do that's okay. Now I'm quite excited because tomorrow I'm going to take this ‘Gold Tooth Aloe’ to the CNE that's the Canadian National Exhibition Horticultural Show and Competition. Here's my entry card. All secure and I'm ready to go. Look at this guy, you've got the Best in Show award. Oh yeah that's pretty good. Look at all those aerial roots. Well look at that foliage. So, we're here at the CNE first day of judging. This green one got honorable mention. That’s pretty good. This one got third place. This guy got second. Oh ‘Gold Tooth Aloe’, no prize for you. Mm don't worry maybe next year first place. Well here is first place. Look how crazy this guy is, nice. Hey everyone so it's a 11:15 in the evening. It's been a really long day and I got my plant. Got my ‘Gold Tooth Aloe’ back. She's a little sad that she didn't get anything. But actually, understands she got to meet some really nice fellows. They were all good sports. So, I hope you enjoyed this episode of House Plant Journal. I'm Darryl thanks for watching. Light: Prefers full sun but will tolerate partial shade. In very hot desert areas it does best with some afternoon shade. Temperature: These are hardy to outside temperatures of about 20 degrees F.
Soil: Needs well-drained soil. Will easily grow in gravelly or sandy soil. Flowers: Reddish-orange spikes of tubular flowers bloom in the summer. These dramatic flowers can grow on a stalk up to 2 feet tall and are a real treat for hummingbirds. There are some simple steps for ideal ‘Gold Tooth Aloe’ care. Water: Water sparingly when dormant and moderately during the spring and summer. Let the soil completely dry between waterings. Fertilizer: It should not normally need to be fertilized. Pests and Diseases: Deer resistant. Watch for mealybugs and scale insects. Propagation: It is easy to propagate with the offsets of this plant. Many people are also successful starting plants with seed. The tips of the leaves come to a very sharp point and as a result these can often become brown and start to die. This is just a normal part of the plant growth and nothing to be concerned about. Simply remove the dried out brown tips to improve the appearance of the plant. Hummingbirds, bees and butterflies all love this plant. Despite its menacing look the leaves are not that dangerous and are essentially ‘touchable’. The color of the ‘Gold Tooth Aloe’ can vary quite a bit depending on the age and growing conditions of the succulent. There are also growers that purposely “stress” the plant to obtain other shades on the leaves. “Stressing” is usually done by providing less water and more sunlight to gradually change the color of the plant.